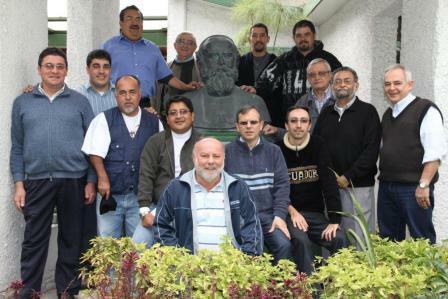 On July 6-12 a total of 20 Comboni Missionaries gathered at the provincial house of Quito, Ecuador, to hold the Assembly of Mission Promotion of America/Asia which had as one of its principal objectives the formulation of a Continental Plan of Mission Promotion (MP). This last statement was borne out in the course of the first day of work during the presentation of the reports on MP in the various circumscriptions. In each one of them there are many activities, some traditional and many others that are inspired by the new technologies of social communications. In his presentation Fr. Jorge made reference to the last General Chapter, pointing out that, even though there were no absolute novelties, there are mentioned three important things: we profess to be “passionate for mission” and, accordingly, we cannot not inflame with this enthusiasm the entire Church; we are heirs of the charism of Comboni which holds MP as one of its fundamental elements; lastly, we Comboni Missionaries reaffirm our option for the poor, a choice that allows us to sensitize the Church and all those who work in human promotion on the universal dimension of mission. In the afternoon, Fr. Alcides Costa, provincial of Brazil South and continental moderator of MP, gave an ample introduction to the Continental Plan of MP based on the statements of the last General Chapter, insisting on the importance of MP as a qualified service of formation, information and solidarity, which aims at opening horizons at a socio-ecclesial level, since this is the concrete expression of our love for mission. One of the most intense moments of the meeting was the morning given to ongoing formation with the presentation, followed by an exchange of ideas, by Comboni Bishop Eugenio Arellano of Esmeraldas, Ecuador. The rest of the assembly was given to very concrete items related to the elaboration of the Continental Plan of MP. A moment much appreciated by all was the pause for a community day on July 10, which included a brief “mission day” in the parish of Machachi with the celebration of the Eucharist with the people and the successful sale of the magazines Iglesia sin Fronteras and Aguiluchos and the visit to the lake Quilotoa. The general evaluation of the assembly, despite the absence of some confreres, was positive. The reasons? The serene and proactive climate of the gathering, the realization of how many activities of MP exist in America/Asia, the participation of the Comboni Sisters and Secular Comboni Missionaries and the awareness of basic traits that recur in MP: vocation promotion and the work of justice and peace and the integrity of creation.